One of the biggest questions humans have about life on earth is, What comes next? What happens after we die? In The Dead Saints Chronicles, David Solomon answers this universal question in vivid detail through extensive study—and groundbreaking redefinition—of the near-death experience (NDE) phenomenon. Drawing from the voluminous body of NDE literature and the testimonies of over 5,000 NDE survivors (or “Dead Saints”), Solomon answers millennia-old Christian questions about salvation, death, sin, heaven, hell, Jesus, and immortality. His overriding conclusion? Heaven is real—though it doesn’t involve the clouds, harps, and pearly gates of popular Christian culture. Having studied NDEs throughout his life, Solomon’s quest to explore this topic was accelerated by a diagnosis of terminal Glioblastoma brain cancer in 2013. His personal insights on death and dying, which are woven throughout the book, lend his message a compelling urgency and immediacy. Provocative, challenging, gripping, and reassuring its part educational volume, part guide, and part memoir. 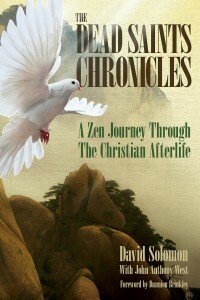 The Dead Saints Chronicles is unlike anything written to date. Meant for readers of all types, backgrounds, and creeds, it dispels widely held myths and fears while providing a clear path toward personal growth and enlightenment—in this world and the next.